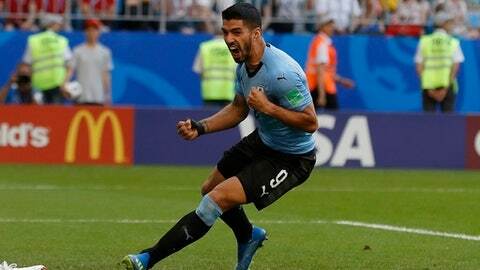 SAMARA, Russia (AP) Luis Suarez finally got rattled at this year’s World Cup. Other than that little blip, Suarez has been on his best behavior in Russia, scoring twice as Uruguay swept through the group stage with three straight victories – sending the two-time champions to the knockout round for the third straight World Cup. By advancing to the round of 16 with victories over Saudi Arabia and Egypt, Russia secured its best World Cup showing in the post-Soviet era. But Uruguay – ranked No. 14 in the world – posed a far greater challenge to the hosts. Uruguay took a 2-0 lead over Russia on an own-goal – the sixth of the World Cup to tie the tournament record. Midfielder Diego Laxalt’s shot from long range deflected off Denis Cheryshev’s foot and past goalkeeper Igor Akinfeev.